Description: CSX stacktrain Q190 rolls east through the signals at CP King on the Morrisville Line as the conductor gives the boys a wave in this view from Gallagher Rd. in Plymouth Township as the foliage blossoms. Description: Southbound BNSF waits at Branch St. and the riverfront for the signal to enter the TRRA. Description: Southbound BNSF waits at Branch for signal to allow train to enter TRRA at North Market. Description: Southbound BNSF waits at Branch St. for signal to allow entrance to the TRRA. Description: 071 powered by 8768 was the first CSX detour train I caught yesterday morning. Description: Our first detour train was NS 075. CSX detoured several trains this way due to massive flooding. The first detour is 075 with an ex-Conrail unit and a leaser. Description: Q327-12 backs into Ensel yard. Description: One of the hazards of railfanning in Georgia in the summertime is the man-eating kudzu plant! Originally brought in by the railroads from Russia to control erosion along the right-of-way, the stuff turned out to be a bigger problem than the problem it was brought in to control! Soon, vast areas of Geogia, Alabama, and Mississippi were eaten by the plant! It grows on anything and everything it touches (there is a utility pole under it out of picture to the left), and it grows so fast that it actually even grows on the tracks themselves! Take a knife with you along with your camera! Description: The new signals at the Lilly crossover on the Fitzgerald sub provide a convenient "frame" for CSX train X549. Description: Q255. Nice of them to put the SD60M up front. Description: By the dawn's early light, a CSX manifest freight sails Southward. Description: Where are the markers? Description: UP’s QHOLI-17 (Quality Manifest Houston, TX Settegast Yard-Livonia, La) heads east at Beaumont, TX. 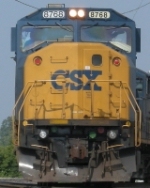 The CSXT 8768 an SD60M was built as Conrail #5528 in February 1993. Description: UP's QHOLI-17(Quality Manifest Houston-Livonia, La) with a ex-Conrail 5528 on the point. Title: CSX 8768 leading Q615 at Lanett in the mid 2000s. Description: Q115 passes a stopped Q333.